Having a basic idea of SEO will help to appreciate it’s benefits. On this topic we try our best to explain “what is SEO”, difference between paid and organic rankings and finally “how SEO Began”. SEO (Search Engine Optimization) means improving the visibility of your website on search engines such as google, yahoo and bing. For a small business, the implications of increased visibility cannot be overstated. A local florist may have a beautifully designed site, but if locals searching for florist don’t find it in the higher search results, it wont be visited. The number of people searching for goods, services and merchandise online is daily increasing. If people can’t find your business through a search engine, they will find your competitors. People use Google, Yahoo and Bing to find cafés, restaurants and theaters. The implications are obvious: if you’re a small business owner, you must rank high to rise above your competition and attract more clientele. That’s the definition of SEO. From one perspective, there’s nothing new under the sun: in the not-so-distant past, people chose their cafes, restaurants and theatres by word of mouth. If your friend had a great sushi at Hiroshi’s Sushi bar, you’d feel inclined to eat there yourself. If your colleagues had a smashing evening seeing the new James Bond at Warner Bros Theatres, that’s where you’d go on your night off. Locations were ranked by word of mouth, and since you trusted your friend’s opinion, you followed their recommendations with some measure of guaranteed satisfaction. Word of mouth hasn’t changed, but the mouth has grown bigger. Rumor isn’t restricted to your close circle of friends; it spans your entire city or even the world at large. When you search for ‘Japanese restaurant’ in Google, you find a list of the most popular Sushi bars in town, regardless of whether your close friends ever visited them. If it’s at the top of Google’s results, you take it for granted that theres some justification behind its high ranking. Mathematically, sites that rank well attract the most browsing visitors. The fast maturity of the Internet changed the rules of the game. Small and mid-sized companies had to rank high to stay in business. They had to develop an online storefront. Some did this more quickly than others; some did it better than others. Some survived while others closed shop. Within a few years’ time, your business’ health included an entirely new concept: search engine optimization. The change, however, was not over. Search engines introduced another tweak to the game: you could pay to be at the top. Here’s an example: go to Google and search for a photographer in your neighborhood (in other words, if you live in Los Angeles, search for a “Los Angeles Photographer”). The search engine will list an array of photographers. At the top of the page, on a different background color, you’ll find a list of ads. On the right sidebar beneath the map you’ll find another list of ads. 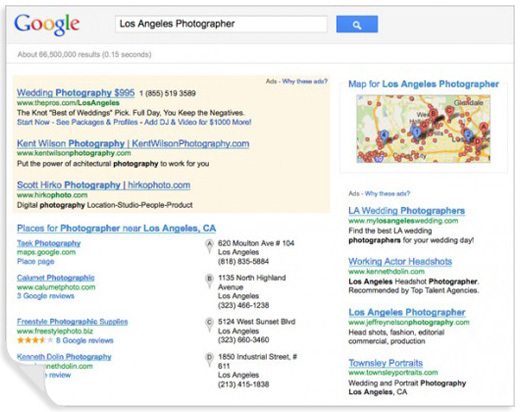 Beneath the top ads, on white background, you’ll find the long list of organic search engine rankings. Ads are paid listings. They’re there for no other virtue than their owners wallets. They’ve paid to be at the top of a particular search query and will be listed there regardless of their quality. As such, they are nicknamed unnatural rankings, or inorganic. Organic website rankings, by contrast, are those unpaid listings beneath the ads. How are they determined? Here search engines had to employ a much more sophisticated approach. They had to find an objective means to evaluate websites. Bear in mind that whatever they’d choose would make or brake markets. So they developed robots that began crawling each site and evaluating its relevance, quality and popularity. These robots never sleep. They’re crawling – that is, they’re indexing websites including this one – even as you read these lines. And they’re getting more sophisticated and precise! Now, let’s say “John Wayne Photography” comes first place in Google’s organic search results for a “Los Angeles Photographer”. John Wayne hasn’t paid Google. His site is at the top for its quality and relevance. In a photographer’s case, this would mean an SEO optimized site with good credibility, which is why Google’s robots choose to list him first. Now, a paid listing loses its rank the moment you close your wallet, while a site that ranks high organically retains its place until a competing site ranks better. That’s what organic SEO means. Your site ranks high by virtue of being good. It ranks high by word of (big) mouth Google, and everyone listens to Google. High ranking suggests prestige and professionalism. The client figures that if John Wayne has enough value to rank high in Google, he’s likely to be a first class photographer. He give’s John a call, and our organic SEO company has played its part. Our organic SEO consultants has years of online ranking analysis behind it. Experience has taught us to specialize in organic ranking, which yield a better return for our clients investment.